The dog tag tattoos are very popular among the people as memorial pieces. They love to get their body carved with the traditional identification mark worn by the soldiers. The practice which started during the civil war in a bid to save oneself from getting listed as unidentified, in case one died during the war, has taken on a new avatar. The art form uses the dog tag to create memorial tattoos. Apart from this (which is most popular) tattoos of dog tags are also worn by soldiers. The people also find it relevant to express their love and affection. Therefore, mothers, fathers, couples, etc. can be seen wearing dog tags with the names of their loved ones. It is also quite well-known for conveying one’s patriotic emotions and dog tags with the flag as backdrop are very common displays. As far as designs of theses tattoos are concerned, you can wear it in the form of a chain or a bracelet or get quotes and other inspiring lines inscribed along with it. Here, we have presented a collection of 25 pictures that will tell you more about the tattoos with dog tags. Take a look. If you liked our selection, perhaps these other posts will interest you too,Cherry Blossom Tree Tattoos, Short Tattoo Quotes, Zombie Tattoos and Arabic Tattoos. The American national has got her back tattooed with a dog tag that bears the flag design to express her love for her country. Lovely dog tag bearing the initials of the husband and wife carved along with a yellow rose that stands for happiness looks charming. Bearing the name of the couple; this black and white dog tag tattoo, etched around the ankle, looks very sober. The mother has got the dog tag tattoo along with the name and birth date of her children as a mark of love. Look at this amazing dog tag that has the American flag waving inside the chain; a sign of national pride. Unique dog tag tattoo done on the ribs looks mysterious but has also got a radiant charm embellished inside it. This ardent dog tags lover got cool tattoos done on his body that is very eye-catching and classic in appearance. Watch out this rip off style dog tag done on the ribs that the wearer got carved in memory of his dear friend. Hanging from a chain, this dog tag serves the ornamental purpose to the hilt and has been also done in a neat manner. Religious and inspirational tattoo created with dog tag and cross that looks classic in its plain format. The side of the leg bears a dog tag that has the line “without sacrifice there is no victory” inscribed on it to serve as motivation. The patriotic butterfly and the dog tag sit well on the foot of the girl and symbolize her national pride. Created on the chest, the praying hands with dog tag look very graceful and are also a popular tattoo design. The cancer ribbons and the dog tags together create a cool tattoo piece that also represents the family members of the wearer. Check out these real looking dog tags that have been carved on the ribs as the wearer is fascinated by them. The girl got the dog tag done on her foot as a tribute to her brother who died serving as an army man. 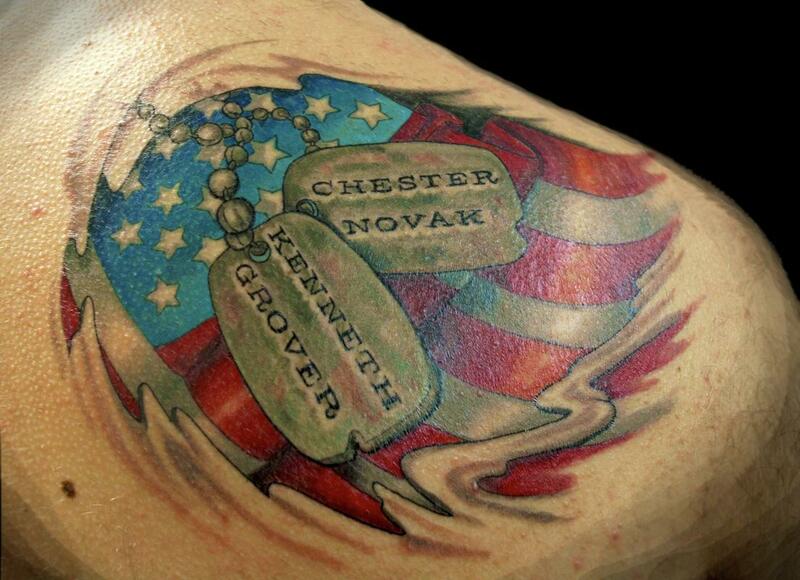 This dog tag tattoo with the American flag forming the backdrop looks very alluring and has got an amazing display. Sober, shaded dog tags done on the foot of the girl look elegant and create a very pleasing picture before the eyes. Dog tag with the initials of the wearer’s mother who is a breast cancer survivor, carved as a mark of tribute. Catchy forehand tattoo carved with the name of the wearer along with dog tags that are an expression of pride in one self. The soldier got the dog tattoo done on his side in loving memory of his fallen comrade. Covering the shoulder and chest, this dog tag tattoo with a chain, makes a pleasant style statement. The girl got the dog tag on her foot as a tribute to her soldier uncle who died on the war front. The man shows off his dog tags tattoo that bear the names of his kids and represent the affection he harbors as a father. This soldier flaunts his dog tags that have become a bit blurred with time but still retain the elegant charm.